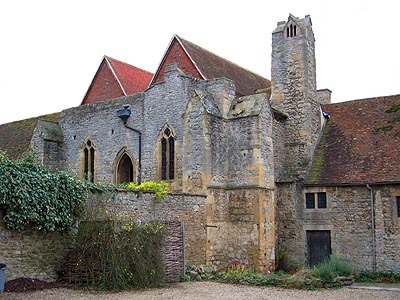 The Benedictine Abbey of St. Mary in Abingdon was an ancient foundation. Fables are told of a Briton named Aben, of noble descent, who escaped from King Hengist of Kent's massacre of the British, at Stonehenge, and retired to a hermitage on a hill (either in Sunningwell parish or in Cumnor - not at Abingdon), soon named after him as 'Abendon'. To here, many resorted and built, for Aben, a chapel dedicated to the Virgin Mary. This will have been in the fifth century. In AD 675, Hean, the nephew of Cissa, a sub-King of Wessex ruling over North Berkshire, left the World and sought a place wherein to live a religious life. He came upon the old hermitage of Aben and built a monastery there, which his uncle endowed. He had a sister, called Cilla, and she, about the same time, founded a nunnery in honour of the Holy Cross and St. Helen at Helenstowe on the Thames - now represented by St. Helen's Church in Abingdon. She possessed a portion of one of the nails of the Passion, which she caused to be inserted into an iron cross and, when she died, this was laid on her breast in the grave. Three hundred years later, in St. Aethelwold's time, a drain was being dug, and the workmen found this cross. It was translated, with honour, to the monastery and there, under the name of the Black Cross, it was the great relic of the place. A figure of it is preserved which shows a Maltese cross within a ring at the end of a handle. Meanwhile, Hean founded his monastery, on Abendon Hill, but he was unable to make much progress. All that he built one day, fell down on the morrow. A hermit who lived in Cumnor Wood came to him and told him of a vision he had had, of men with carts taking stone and timber away from the site of the buildings. He had rebuked them and they replied, "Go and tell Hean that God wills not to have a church built here, but at Seovechesham, where the place shall be marked out for him by a sign." Now, Seovechesham was a site, down in the river valley, which Cissa had given to Hean. Thither Hean went and found, near the Thames, a foundation marked out by furrows. So he moved the site of his Abbey to Seovechesham and called the place Abingdon. This is the tale of the beginnings of Abingdon - the most picturesque part of its history and undoubtedly marking it out as a very early foundation. The salient points of the later history are these: the total destruction of the place by the Danes in the ninth century; the taking over of the estates - save a small portion - by King Alfred; the revival and establishment of the regular Benedictine observance by St. Aethelwold, afterwards Bishop of Winchester, in about AD 950; and the abbacy of Faricius, an Italian, who came here from Malmesbury in 1100. He began a new church to the south of the old one and it seems likely that the eastern part of this survived to the end. The completed church was dedicated in 1239. In the fifteenth century, four successive abbots made great additions, rebuilding the nave and constructing a central and two western towers. The surrender was made on 23rd February 1539, by Thomas Pentecost or Rowland, the last Abbot. He and twenty-four monks received pensions. The annual value is variously stated at £1,876 and £2,042. William of Worcester, gives us a jejune, but, we hope, accurate account of the dimensions of the Abbey Church, from which we gather that it consisted of a nave, with aisles, of twelve bays, transepts, with chapels, and choir with eastern Lady Chapel. The total length was about 300 feet (Nave 180ft, Choir 65ft, Lady Chapel 36ft, Crossing 36ft). The church is now wholly gone, though limited excavations have revealed its extent. There is, indeed, very little left even of the associated buildings. The beautiful gatehouse, spanning the road, is much restored. On the left, it is flanked by the church of St. Nicholas, built by Abbot Nicholas of Culham (1289-1307). The main buildings of the Abbey were on the left as you proceed up the road through the gatehouse, but they are gone. What survives is part of the domestic buildings, on the right. A house which is reckoned to have been part of the Abbey's exchequer has a very beautiful chimney of the thirteenth century with gabled top and triple openings therein. 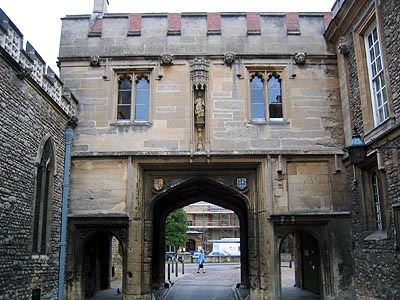 An adjoining long structure in two storeys consists of an fine timbered eastern gallery and a western vaulted undercroft with twin chambers above. The library of the Abbey must have been of good quality. One of the manuscripts of the Anglo-Saxon Chronicle (Tiberius BL) has been traced to it. Another, a fourteenth century chronicle of the Abbey, at Trinity College, Cambridge, is most unusual in form - very tall and narrow - but finely written and illuminated. A third, a twelfth-century copy of Florence of Worcester, now kept at Lambeth Palace (No. 42), is one of the most beautiful pieces of plain writing and austere decoration known. The total number of extant Abingdon books is inconsiderable.